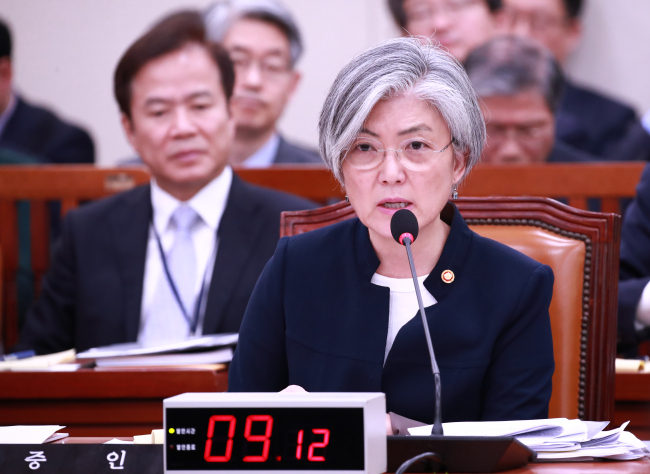 Korea is not considering any additional deployments of the US’ Terminal High Attitude Area Defense anti-missile system, Foreign Minister Kang Kyung-wha told lawmakers Monday. She also reiterated that the country won’t participate in the US-led missile defense networks. “We are not considering any additional THAAD deployments,” Kang told a parliamentary audit of the Foreign Ministry in Seoul. The THAAD battery, comprising six interceptor launchers and a radar, has been deployed by the US military in Seongju, North Gyeongsang Province. “There is no change on our stance that we will not participate in the US’ MD networks,” said Kang, while stressing that Seoul will focus on the early establishment of the Korea Air and Missile Defense system, South Korea’s independent missile shield. “Let me be clear on this. As explained on many occasions before, the THAAD system is a self-defense measure that has nothing to do with the MD,” the minister added. The South Korean military has been scrambling to establish its own anti-missile system by the 2020s, and the US has agreed to remove limits on South Korea’s missile payloads, which has limited the weight of warheads to 500 kilograms. On differences South Korea and China had over the deployment of THAAD here, Kang said there is “nothing to apologize for” and Seoul plans to talk with Beijing to organize President Moon Jae-in’s visit there soon. The two nations have frequently discussed major issues “at various levels,” said Kang. China has strongly opposed Seoul‘s decision, citing national security concerns and later launching economic retaliation against South Korea for it. The minister also said that trilateral military cooperation between Seoul, Washington and Tokyo would not extend into a military alliance. “The security cooperation among South Korea, the United States and Japan operates within the frame of effectively countering and deterring North Korea’s nuclear and missile threats -- It will not develop into a military alliance,” she said. The three nations recently participated in a two-day missile warning drill in waters off the coasts of South Korea and Japan. The drill focused on training for the detection of warships and tracking incoming missiles through radar. The exercise took place after North Korea fired a ballistic missile over the northern Japanese island of Hokkaido. The missile landed in the Pacific Ocean on Sept. 15. Kang also highlighted the need for strategic dialogue among Seoul, Washington and Beijing and that Seoul will seek ways to establish the necessary framework. Last week, President Moon labeled South Korea’s relationships with the US, Japan, China and Russia as the foundation of its foreign relations with the common goal of bringing about the peaceful denuclearization of North Korea.